Sutherland Shower Caps are individually wrapped in easy to open bags making them an ideal travelling companion. The shower caps are waterproof and keep hair dry while showering/bathing. These shower caps are used in hospitals, care homes, hotels and bed and breakfasts around the UK due to their quality and their hygienic single-use design. Each cap has an elasticated band for a secure and comfortable fit. 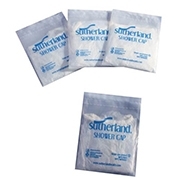 Sutherland Shower Caps are also ideal for use during spray tanning as they keep hair clean and they can be thrown away after use. They can also be used in other beauty treatments such as aromatherapy massages as they will stop hair becoming greasy and are comfortable enough to wear for prolonged amounts of time.